Click "More Info" to book this room! Did I mention the view? 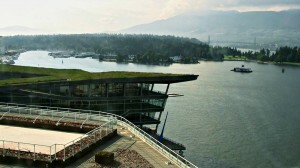 From the room at Pan Pacific Vancouver. The Room: The curvature of the building assures everyone on the harbor side gets a good view. While that makes for some awkwardly shaped rooms, they somehow manage to pull it off in this sail-shaped space with extra guest chairs along the wall and other furniture to fill the otherwise peculiar open spaces. Every piece of furniture here is pointed at the window (with the exception of your chaise lounge, which faces the television and is exclusively for elegantly slamming Molsons and watching hockey), taking full advantage of the large windows and the view…oh the view. Lightly snow-capped mountains in the distance with sun-drenched timbers waving on the islands in between you and whatever is on the other side of that bridge while watching seaplanes glide in for a landing make for hours of daydreams…and very little work. The bed is as comfortable as you’d want it to be with a slightly firm mattress and good quality linens. There’s a well-stocked mini bar but the ratio seems off. I’d expect a few more beers and a fewer tiny bottles of booze. Where’s the Labatt Blue Lite? Internet, wi-fi or otherwise is NOT complimentary which is likely the bigger of the two complaints I have about being there on business, the other being the tiny desk next to the window I can’t stop staring out of. Service: Sooo friendly and so helpful. When I needed directions to the convention center, they politely responded “Just out the door, to your right, sir”. They were correct….right next door. Check in, room service and valet were all a breeze. 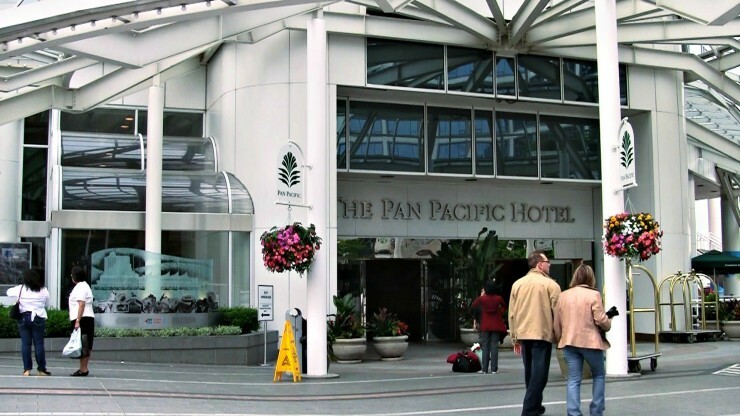 Overall: The Pan Pacific Vancouver has a dated feel to it, but the rooms have been maintained and refreshed while the scenery should distract you from noticing the hotels original mid-80’s splendor. Rooms here are comfortable, clean and the service just slightly exceeded expectations with smiles and a helpful attitude. There was a ship (cruise) docked briefly next to the hotel but I didn’t get to see it set sail.